“Via Ferrata” or The Iron Way in English is an extreme hike which takes you to places only experienced alpine mountaineers would ever be able to find themselves. Perched 2000ft above the stunning Lauterbrunnen valley below and stood on only staples this was the true alpine adventure I had always dreamt of. No guides or chaperones we set off on this amazing exploration on our own…a truly unforgettable experience awaited! Ever since we started climbing a few years back I have always wanted to give Via Ferrata a go, it is somewhere in-between climbing and scrambling but infinitely more exposed and also quite well protected…the perfect combination! But alas the UK has very few in the way of Via Ferratas and doesn’t really have any “true” examples. The alps is where I had set my sights, the beauty of the surroundings and the extreme nature of it’s peaks and cliffs. 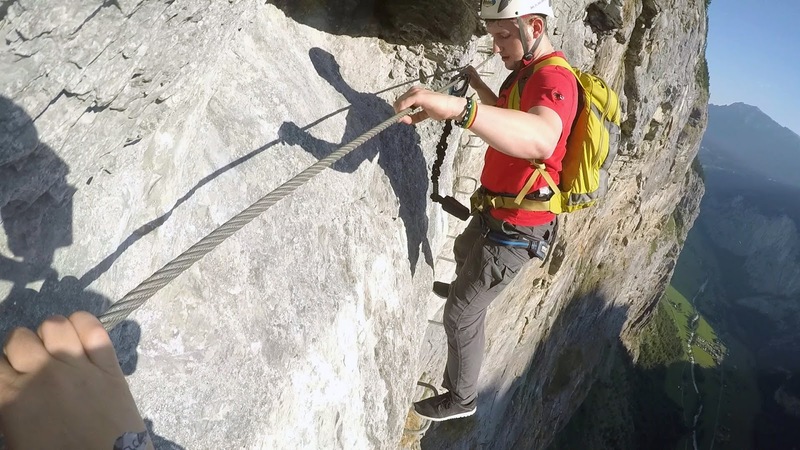 A Via Ferrata (Klettersteig in German) is essentially a climbing/ hiking route which uses a steel cable attached to the wall every 10-30ft as well as pegs, staples, ladders, wires and bridges to help navigate the terrain. You have a harness with two specially designed slings and carabineers on the end which you keep attached to the cable, unclipping and re-clipping one at a time to transition between joints and obstacles. However, in a similar way to lead climbing, a fall on here would result in possibly quite a violent and long drop…not to the valley floor below (hopefully!) but at least till the last clipping point, which could be a whole 10ft lower down the cliff face or even a full set of ladders…not something to be taken lightly! Rated at VF 3A this route is not one which was particularly technically challenging for us, being climbers, but did offer a really enjoyable day in positions of exposure our experience levels of climbing would just not allow right now. However, no matter how easy going the terrain a slip can happen at anytime, and with 2000ft of air below you safety has to the main concern! 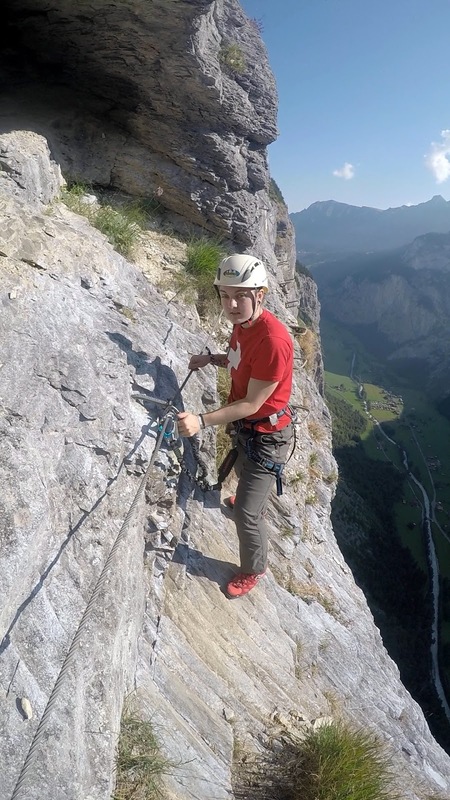 The origins of the Via Ferrata itself is quite interesting, this one we did is quite a new feature having been constructed in 2008, but many date back to the war in the Alps. Of course, many protected paths have existed in the Alpine region for centuries but they became famous for the role they played in the First World War. As the Austro-Hungarians fought back the Italians in the challenging and extreme conditions of the Alps and Dolomites fixed lines were created in order to help troops ascend and decent steep cliffs and mountainside. We began the day with an early wake up call, we wanted to be up and on that mountain before anyone else and also had an action packed afternoon planned! We drove from Interlaken to Lauterbrunnen and arrived just in time for the first cable car of the day: 6.20am! Now, I am really not one for early starts but when you have such an amazing day ahead of you sometimes you can make an exception! First things first, Breakfast! We headed to the wonderfully placed “Hotel Eiger” for something to eat whilst watching the sunrise above the mountain itself. It was quite breathtaking sight to see the rays of sun reflecting off the famous north face and into the sky whilst fuelling ourselves for the hike ahead! Murren itself is a wonderful little town which sits 5,413 ft/ 1650m above sea level (That’s higher than Ben Nevis by 1000ft!) and is unreachable by road, even up here all that buzzes about is little electric buggies! Later on in the day we explored it further on our way back down, the main road and little streets which lead off are just magical. 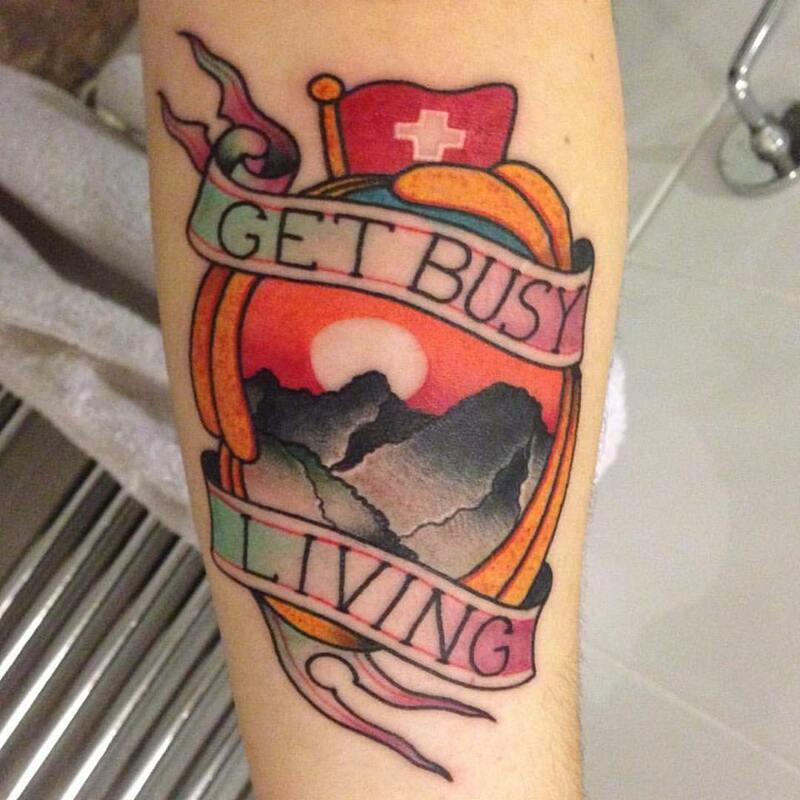 It’s the epitome of a little Swiss mountain down and pretty much fulfils all of those dreams you may have had about Switzerland and the Alps! So, on to the Via Ferrata itself! The beginning section is pretty tame with even a practice section available before you begin your decent. 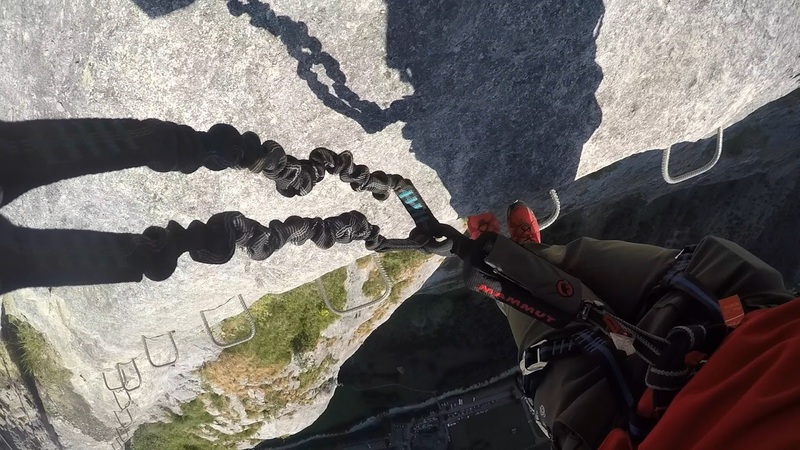 One thing to note about this particual Via Ferrata which makes it quite unique is the fact it goes down rather than up. This on the other hand traverses down from Murren at 1640m to Gimmelwald at 1350m! The first sections consist mostly a steep set of steps downwards through the forest with no real exposure, at this point it is literally a walk in the park! 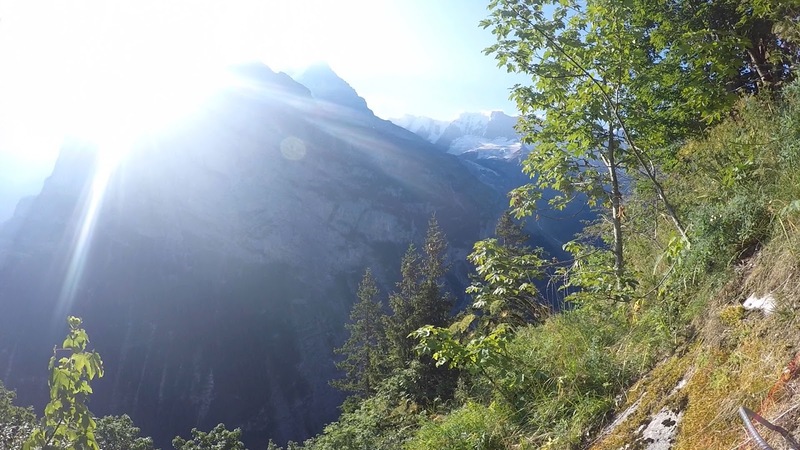 But as you continue your decent the trees begin to thin out and the majesty of the Lauterbrunnen valley creeps into view. All is pretty plain sailing for the first few section with a few ladders here and there and the occasional hint of exposure (the going is easy but best not to unclip as a fall would result in you tumbling through the trees towards the edge!) Then it starts to get a little more interesting as you approach a clearing in the trees! Here you find the BASE jumpers platform! 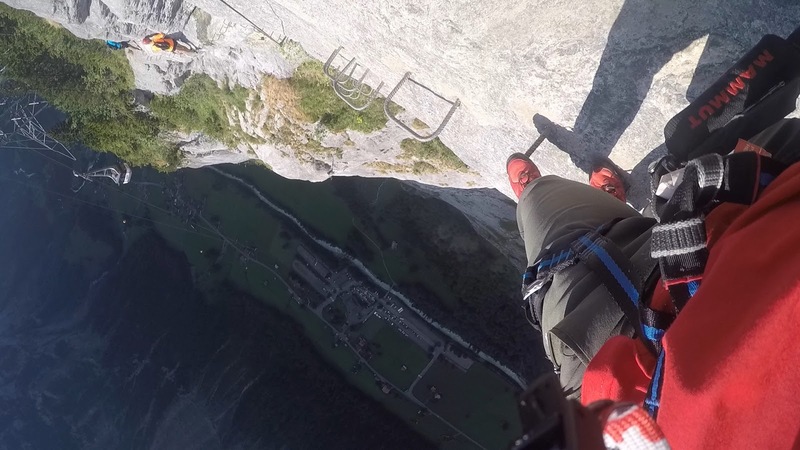 Unlike many places, here in Switzerland BASE jumping is legal and very much supported. 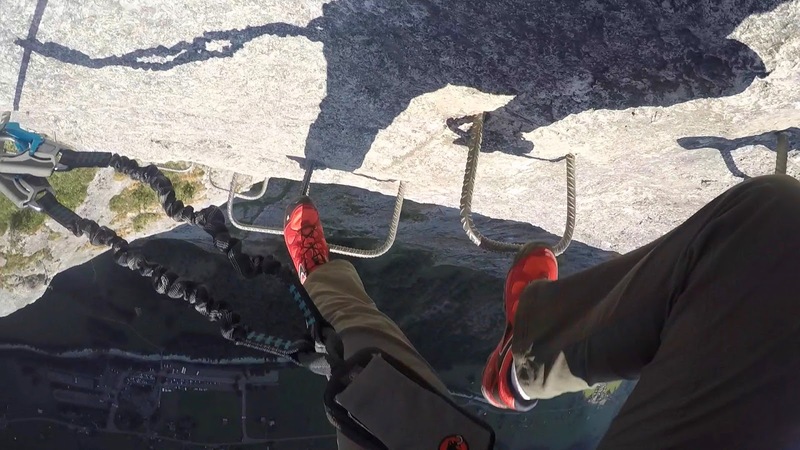 This constructed ledge hangs over the 2000ft below giving a clear and safe take off point for jumpers, the only rules are that they must check that the route is clear of paragliders and helicopters using the walkie talkies provided! This way fewer people die in BASE related accidents than in places such as Yosemite where the sport is illegal. We stopped for a while to perch on the edge of this impressive ledge, for me being clipped in means I have no real fear of the height. In fact I could have sat there all day, I loved the openness and beauty of it! Shorty on the other hand despite being nowhere near terrified was a little less comfortable on here! Part of me can see how you might just leap off here into the valley below…although doing it would be another story! From here on in things ramp up a notch or two, not far past the BASE platform and even the easier sections are balanced precariously above the lip of the great Lauterbrunnen wall. But if we thought this was exposed then what came next was a whole world of extra crazy…but this is exactly what we came for! That drop was simply breathtaking! Dropping down a few meters and we found ourselves on the walls of the valley itself, stepping only on steel staples cemented into the walls the valley floor was 2000ft directly below us! This was as sheer a face as you could get, pins for feet and the steel cable for hands, that was all that stood between us and that huge drop! What a thrill! I really couldn’t get enough of it! For me, I would have loved the whole route to have been this exposed! Balancing precariously as we traversed the staples, despite the 2000ft drop I felt safe and was in my element! A fall here however would have been quite the heart stopper but all I wanted to do was take in every moment of the wonderful surrounds we found ourselves in. 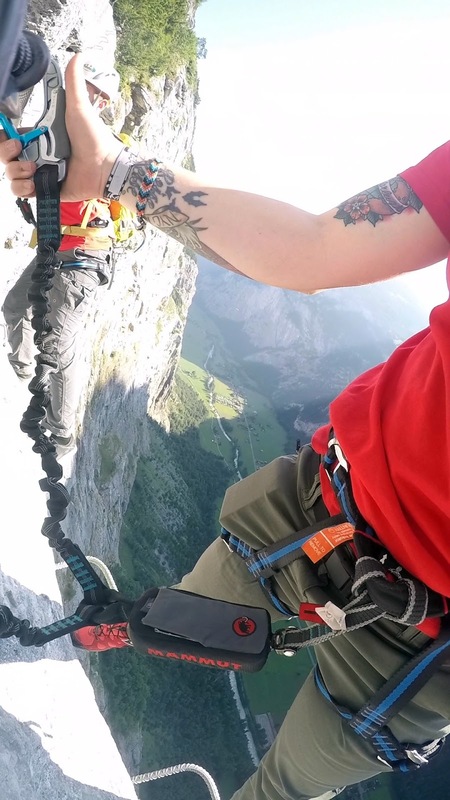 At times I really had to pinch myself to think that this dream was now a reality, here I was perched 2000ft up on this amazing wall with the Eiger, Monch and Jungfrau in the backdrop. This is what you call seizing the day! But the route wasn’t over yet, we had more to come! After longer sections of more mild exposure came the larger of the two tyrolean’s. This one dropped back into a wide gully carved into the valley wall by a powerful waterfall. Stepping out onto the single wire crossing we could feel the ferocity of the water pounding the gorge below us! Now it was time to head back towards the cliff edge and a series of ladders. The exposure here may only be modest compared to other sections but as the ladders become over hanging in parts and a slip would result in a rather lengthy and nasty fall caution is needed! Now, after hours of hiking along this most epic of routes came the grande finale; the Nepalese bridge! 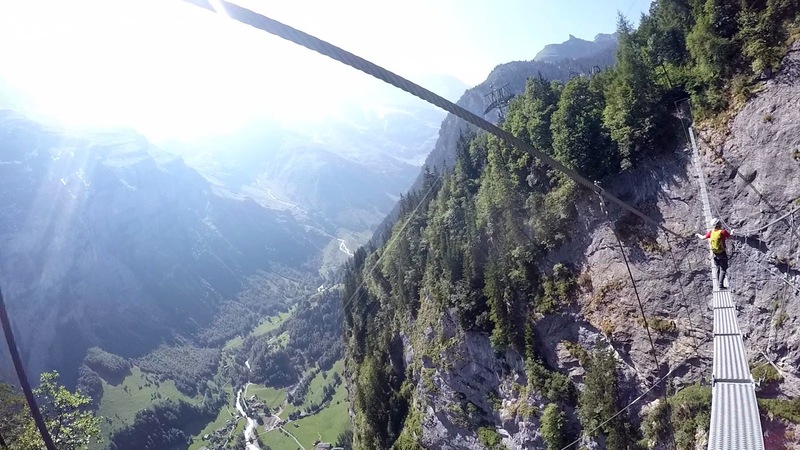 This consists of an 80m swinging steel bridge over a 1000+ft drop! This airy crossing is made all the more unstable by the fact the hand cable only runs along the inside edge! 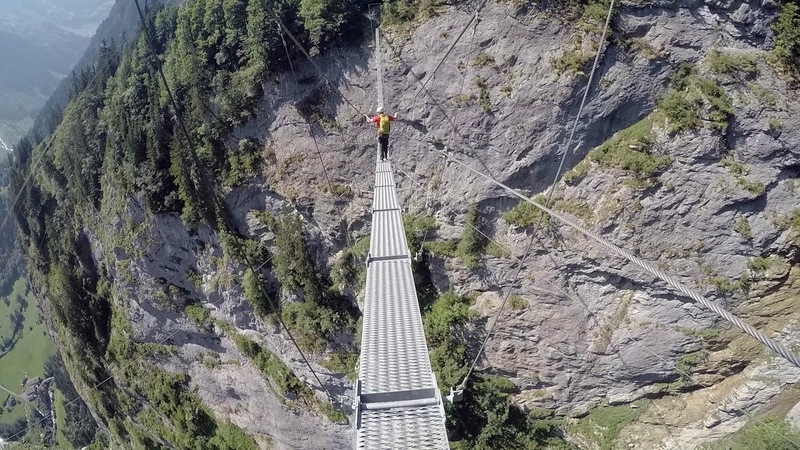 Falling off the right hand side of the bridge would mean swinging helplessly below it! Undeterred however we decided to test our bottle and hang off the edge of the bridge hold only onto the thick and slippy steel cabling! This was the ultimate adrenaline rush to be hanging above such a dizzying height! As I mentioned earlier in the year, Shorty came here on a stag/Batchelor party. That’s why he is wearing different clothes in this photo!! He didn’t want to do it again! After finishing off the final scrambling sections of the route in what had become sweltering heat we finally reached Gimmelwald. Despite the relative ease of the route it is a hike non the less and in temperatures of 35c we were in need of a good rest! Gimmelwald I can safely say is one of the most stunning places I have every been lucky enough to find myself in. The town sits in a lush green valley at 4472ft and is surrounded by the unspeakable beauty of the Bernese Alps and the base of Jungfrau. The village itself only has a population of 130 given that it’s traitional arcitecture and way of life remain it is on the inventory of Swiss hertitage list. Up here it really does feel like something from the sound of music, sitting back on the chairs of the Mountain Hostel with a cold drink looking out on this amazing scenery, there’s nowhere else in the world I wanted to be! Unlike many of the activities you can do in the region you can easily do this on your own and without a guide. This makes it a great budget activity as all you pay for is the cable cars and equipment rental which comes to roughly 30-35 CHF each! Whereas a guide will set you back around 90 CHF each. All you need really is a head for heights and a basic knowledge of safety equipment. Before the route starts there is a safe section in which you can practice your technique with instructions attached to the wall. As long as you have your harness on correctly, make sure you always keep at least one clip on the steal wire and take your time you will be safe and have an amazing adventure! Via Ferrata is a distinct step up from basic hiking and walking up mountains, it requires a head for heights and includes some very exposed sections, but unlike climbing or scrambling doesn’t require specialist skills and strength. You will need standard Via Ferrata equipment to safely navigate this route. Comfortable and sturdy shoes, approach shoes if possible. 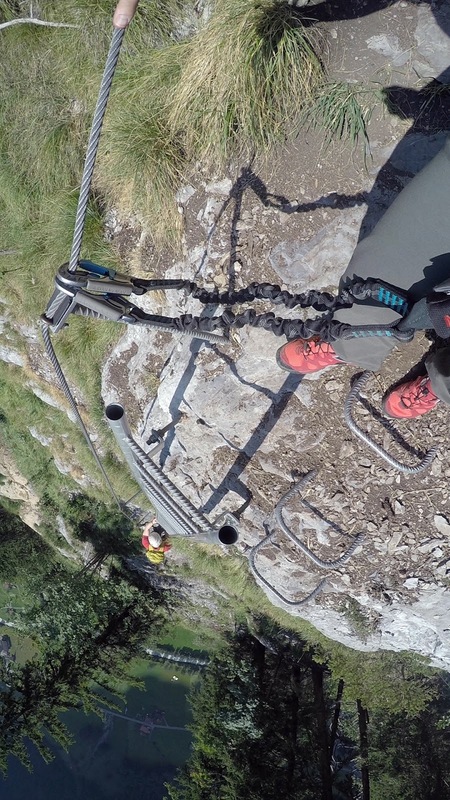 You can rent out the whole Via Ferrata from a few local places. However we rented ours from VerticalSport in Interlaken the evening before. Rentals cost between 20-25 CHF each which makes this a cheap activity to do in the Interlaken area! From Lauterbrunnen take the cable car (right near the train station) up to Grütschalp train station, from there you can take the train along the stunning route up to Murren. This jouurney in total take around 20mins, you can buy a ticket for the whole route from the machines at Lauterbrunnen. We only bought single tickets as we planned on heading up the Schilthorn after but as you end up in Gimmelwald the best route back is to take the cable car down to Stechelberg which is in Lauternbrunnen valley. From there you can take a short bus back into Lauterbrunnen itself or enjoy a walk through the impressive valley. Once you are in Murren the Via Ferrata can be hard to find as it’s not very well signposted. Walk down past the tennis courts and turn left and what looks like a driveway to someones house. Soon you should see a tunnel in a stone wall, head through there to begin the route! What an amazing experience, this is what we came over to Switzerland for, amazing adventures in even more impressive surroundings. What a wonderful day! Next up we would love to head over to the mecca of Via Ferratas; the Dolomites for some more challenging and longer courses. 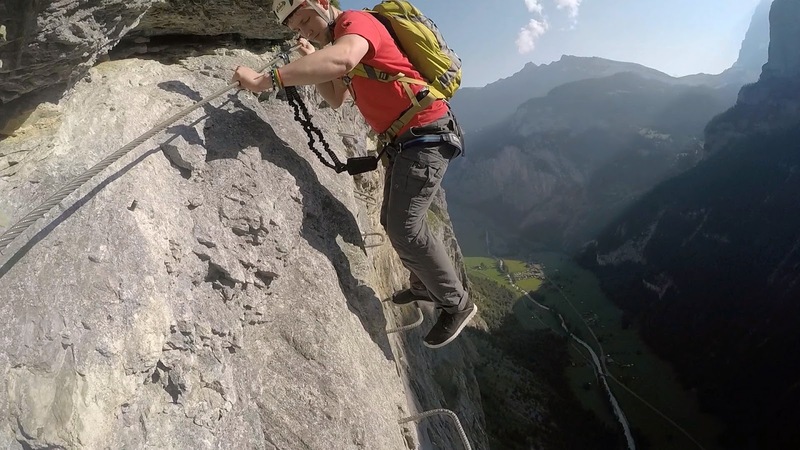 Bookmark this article Via Ferrata 2000ft above Lauterbrunnen valley, Swiss Alps! Thanks for sharing your amazing pics and video. 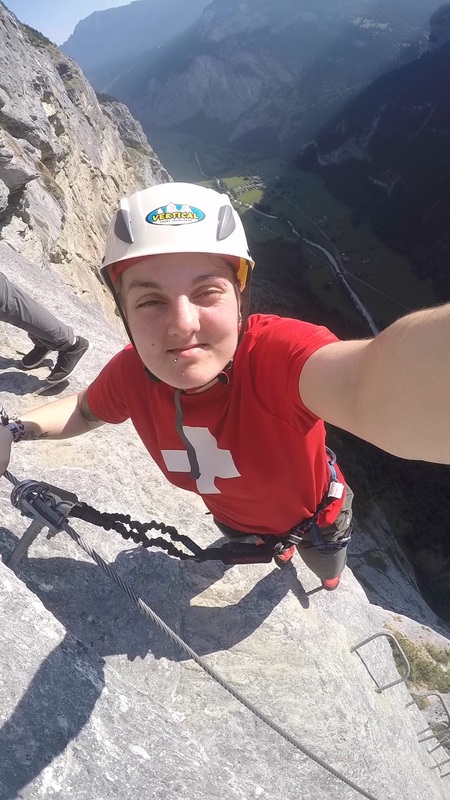 We are planning our Switzerland trip in Sept and after reading your post about Via Ferrata, we are very much interested to do this adventure. Would you mind sharing which camera did you use to take these beautiful pics and videos? Thanks! Woow! That’s amazing Guys! 🙂 We are looking for some adventerous tracks and was interested in via ferratas in Dolomites but now maybe Switerland will be first… Thanks for sharing the post and video! Definitely need to be there!